As I was scrambling madly to get lunches made the other night, I thought about this sandwich filling and wondered if I'd ever blogged it. Sometimes we forget the basics and only blog the fun and fancy-looking stuff. But "basics" are good too, and probably what I get requests for the most. This has been my "go-to" for lunches for my kids and myself, for probably over fifteen years for SO many reasons. Garbanzos (or chickpeas) are cheap, whether you cook your own from dry, or buy them canned. And besides being cheap, this is super easy, good for you, (because beans, duh), and my kids LOVE it. 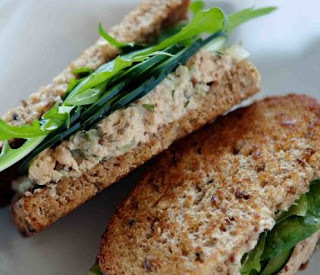 I realize there's approximately twenty-hundred similar chickpea sandwich recipes out there, but this is the version we like - and next time someone asks me about my sandwich, I can just say "it's on my blog". The chickpeas mash up nice and flaky, not entirely unlike tuna, and the optional bit of kelp or other seaweed gives it a very faint ocean flavor Definitely give it a try, even if you weren't ever a tuna sandwich fan! Pulse the chickpeas in a food mixer until flaky, or mash with a fork. Pulse the celery, onion and dill pickles until finely minced, or mince by hand. I tend to like the hand-minced texture better, but then it's not QUITE so "quick and easy", so, your call. Add celery and stuff to the bowl with garbanzos, stir in all the other ingredients, adjust seasonings and mayo to taste. We like this best after it's refrigerated overnight, then spread on toasted sourdough or wholegrain bread, (or with crackers, for my bread-averse child). I like greens or sprouts added, sometimes my kids do, and sometimes they pick the green stuff out. Who knows what they'll prefer tomorrow!